In the last chapter, we developed a "data" component that we use to provide relevant feed data to our application. When we were developing it, our relatively simple FeedManager was our only UI component. Now we will develop a more complicated FeedAggregator component that will listen for the same events but manage the received data differently to accomplish its purpose. Now that our component exists in our running application, we need to incorporate it so it can interact with other components on the page. Since the component will be displaying the details of specific feed items, it will register as an interested party to the already-implemented dataFeedInfo event. It will not, however, need to request this data, so it will not emit a uiNeedsFeedInfo event. In handling the data response, our component will need to make sure that existing items are not duplicated. 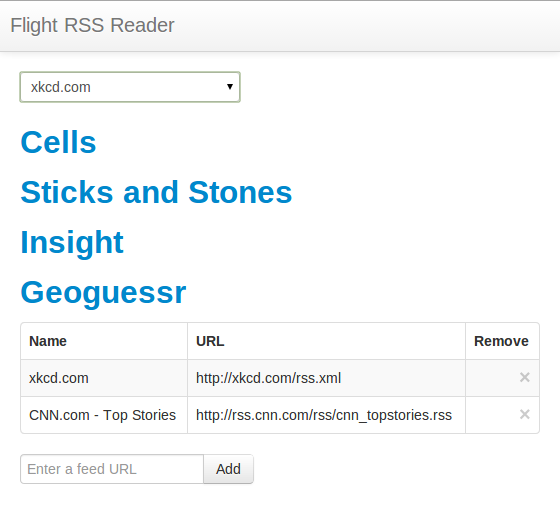 We will also implement filtering by source to see only items from a given RSS feed. We will start with the same basic component functionality we saw with the FeedManager and build on that. 0001:    // Now that we are testing RSS feed entries themselves, we'll need fixture data. 0003:    // OTHER_FEED_DATA, and OTHER_FEED_ITEMS. This component now has the basic workings of our FeedAggregator - it will listen for the appropriate "data provided" event and insert entries provided by that event into the bound DOM element. Note that we've separated the act of inserting an entry into our component from the function that processes the received data. It's a convenient way to make our code easier to read and follows the idea that work functions should be distinct and separate. The function bound as our event listener extracts the individual entries from the feed data provided by the event and inserts each one individually, allowing us to manage the event handling code separately from the UI update code. Of course, it doesn't actually display the data yet, so let's quickly build that functionality before moving on. Doing so will let us interact with our app to demonstrate the behavior we will then move on to eliminate - duplicate entries. Nothing so far is particularly different from what we've seen with the FeedManager, but we needed some groundwork to demonstrate some unexpected behavior. Open the application, enter any valid RSS feed, and submit the form. The FeedManager will add it to the list and fire off a uiNeedsFeedInfo event, which our FeedService will listen for and respond with a dataFeedInfo when the data comes back, which will cause our FeedAggregator to display the list of entries for that feed. Now enter the same feed URL and submit it again; you'll see that our FeedManager and FeedAggregator both oblige the same set of events by creating new, duplicate entries for the feed and displaying the data twice. Let's look at one possible solution to prevent that from happening. As we look at some of the different solutions available to prevent duplicating RSS content, it will be helpful to have tests in place to tell us whether or not our implementation works. Proper behavior-driven design will have us write a test that treats our component as a black box with some valid set of inputs and assertions on the resulting outputs. Avoiding the temptation to peek at the component's internals will save us some trouble when we refactor it to use different strategies. Our test recreates the scenario we just played out from the event communication perspective; we send identical data twice to our component and expect that it does not appear to change the number of visible feed entries. Let's now look at one possible way to prevent data duplication - inspecting the existing rendered entries and ignoring insertion calls for entries that are already displayed. We may have to re-examine our choice when we implement filtering by source since this approach doesn't scale well, but for our current purposes it will work fine. 0004:        var exists = (this.select('feedItem'). Our validation check inspects all of the currently-displayed feed entries to see if any of them have the same destination (via the link property) as the entry being inserted. If no entry with a matching destination is found, then we format the template and insert it into the rendered set of entries. It's enough to get our tests passing and demonstrates a convenient way to store & inspect state by storing it in the DOM. Some UI components may only be interested in some small part of the data responses, like our FeedManager. In those cases, where the entire set of relevant data is displayed to the user and only a very small subset of the source data is used, using the DOM as a state storage device can work well enough to be useful. However, when the needs for managing state get too complicated, constantly querying the DOM and extracting data from it can get slow, unwieldly, and difficult to manage. We'll now implement a way to filter the displayed feed entries and test the limits of our DOM state management solution. The first step is to create the select element itself and make sure it updates with new source feeds as they are added. This test checks for some filterSelector element to be populated with options for each feed added. It should start empty (barring the default "Filter By Source" option), and when a feed is added, an item should be available. Getting this test to pass will involve changing our component's response to the dataFeedInfo event; in addition to populating the list with feed entries, we will now also need to add the feed data to our filter selector. There are two ways to approach this: either we can modify our updateFeeds method, or we can attach another event listener for the dataFeedInfo event to the document. Because our updateFeeds method is relatively simple and delegates out to different functions internally, we will choose option #1. 0008:       var exists = (this.select('filterSelector'). We'll need to make a few changes internally. First, we need to store entries when we get them! We'll override all local entries when new feed data arrives to avoid unnecessary additional complexity for now. Second, we don't necessarily want to render feed entries as soon as the data arrives; the user may already have a filter applied and our app's behavior would be incorrect if we displayed them immediately. We'll want to encapsulate our logic in a render method, which will empty out our feed list and re-insert entries based on the filter. Lastly, we'll need to bind changes to the filter selector to a callback to re-render our component. There is a third method for storing state associated with components, one used by Twitter for the Timeline component, which attaches relevant metadata as data-* attributes on the DOM nodes themselves. We could have tagged each of our displayed feed items' parent nodes with data-feed-source (for filtering by source and removing feeds) and data-published-date attributes (for sorting by recency), and that solution would have suited our purposes equally as well. We will revisit our decision to store state locally when we look at mixins, which can help alleviate some of the complexity of storing state in the DOM. In this chapter, we created a new component to display entries within RSS feeds and integrated it into our existing application structure without modifying our other components. Unlike our FeedManager, which stored its state in the DOM, the FeedAggregator component needed a more robust representation of state, which we were able to implement without touching any other component. The result is a relatively complete RSS headline reader, with the ability to add and remove feeds and preview each feeds' entries. In the next chapter, we will build a way to display the full contents of a feed entry and de-clutter the app so all of our components aren't always visible.